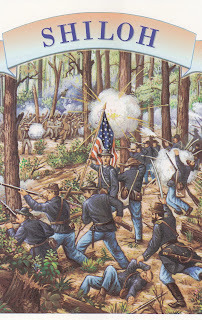 The stamped card with a 20¢ postage, depicting the Battle of Shiloh that ended on April 7, 1862, is one of the twenty cards corresponding to the twenty 32¢ American Civil War stamps issued at Gettysburg, PA on June 29, 1995. The stamp set has 16 individual portraits and four battle scenes, chosen from a master list of 50 subjects including Presidents, generals, major battles, rank-and-file soldiers, women, African and Native Americans, and abolitionists. With those stamps, USPS intended to show the wide variety of people who participated in the Civil War. Battle of Shiloh, named after a church on the battlefield, was one of the bloodiest battles of the Civil War. Ironically Shiloh means “place of peace.” Confederates surprised General Ulysses S. Grant at Pittsburg Landing, TN, but lost General A. S. Johnston. Union counterattack at Shiloh Church forced the Southerners to withdraw. After this pivotal battle, it left Union armies in control of the central Mississippi River and large areas of western territories. Casualties: 13,050 Union, 10,700 Confederate.